HAVANA (30 November, 2010) – What does it mean to focus on the massive practice of sport and physical activity, from the rearrangement of the sports system and the restructuring of its network of centers? Why does this proposal, after 52 years of revolutionary sport, appear in the Draft Guidelines for the Economic and Social Policy of the Party and the Revolution? 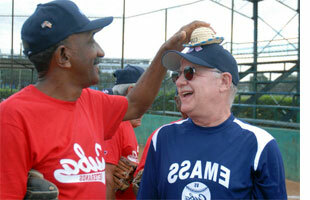 (HAVANA, Cuba, 17 November 2010) – [AN] Some 40 US senior softball players are currently in Havana city playing a series of games against their Cuban counterparts, the second in two years, in a trip that aims at sharing their love for the sport and closing the gap between the two peoples.